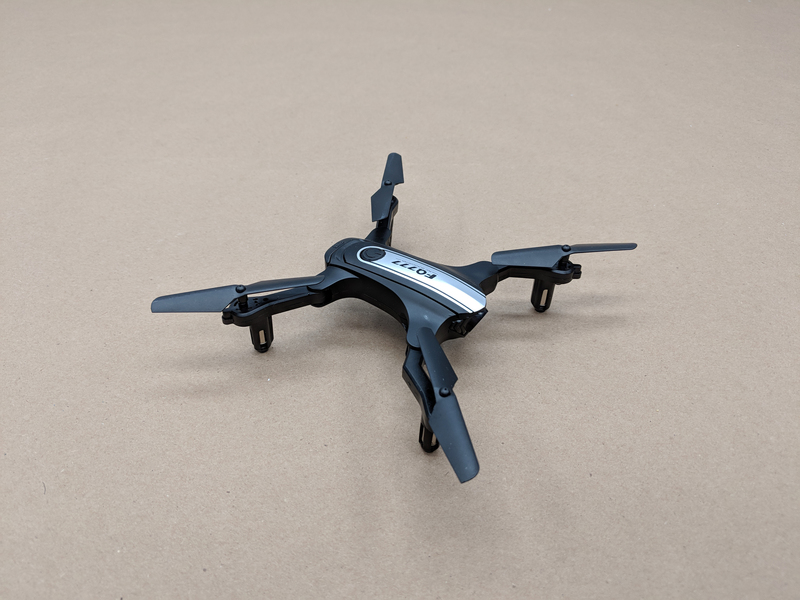 As time goes on, I am more and more impressed by the small quadcopters available. 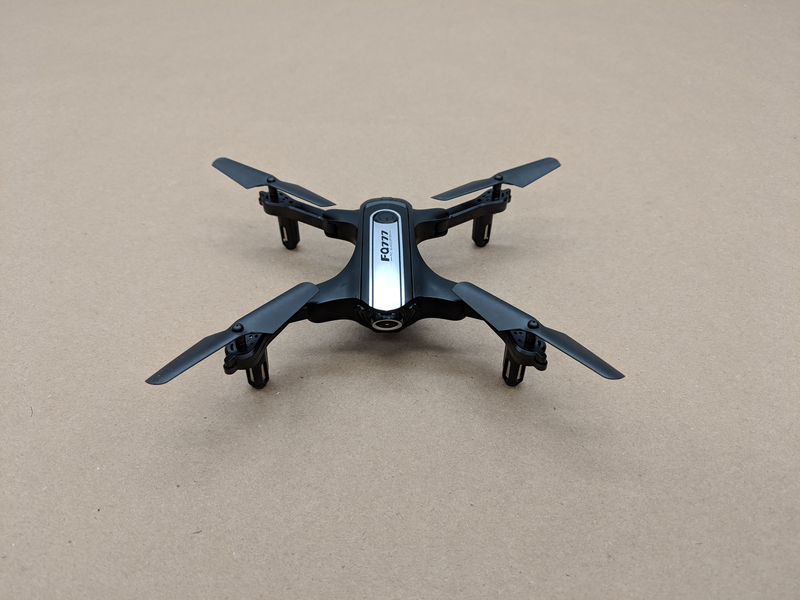 Folding arms, HD video, and an array of new features can all be found on these tiny machines! 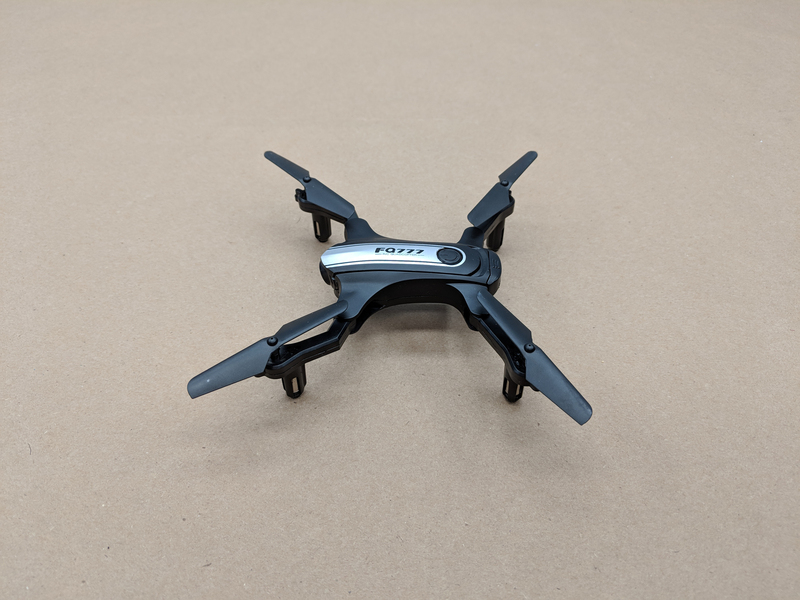 The new Fuqi Models FQ31W is no exception – its options include a 720p video and 2MP camera, FPV through WiFi, folding arms and a compact size, and even some features usually found on only larger drones. 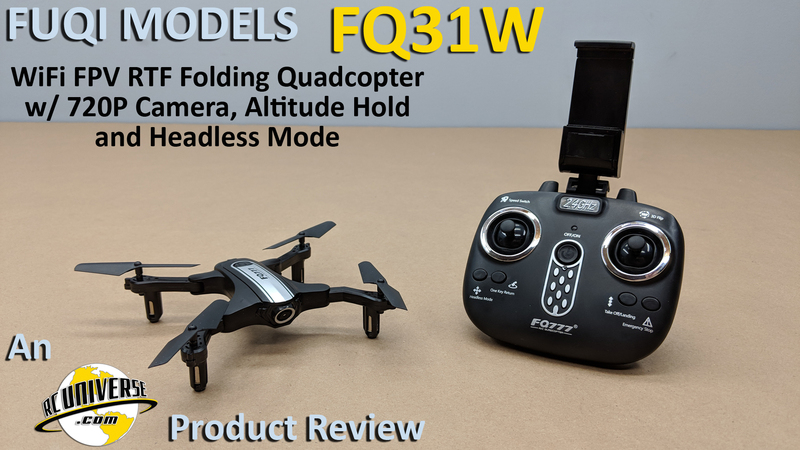 With features like headless mode, one key return, one button take off and landing, and altitude hold, the FQ31W certainly seems to rise to the top of the list! Now, if I told you that this was all available for less than $33.00 (with coupon code) AND free shipping, would you believe me? Well, it’s no lie! 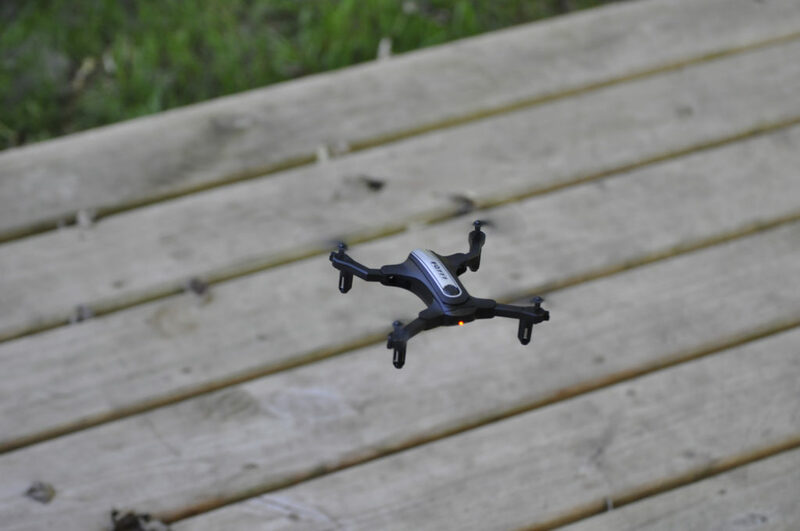 Read on to find out more about this pint sized, feature-packed quadcopter! 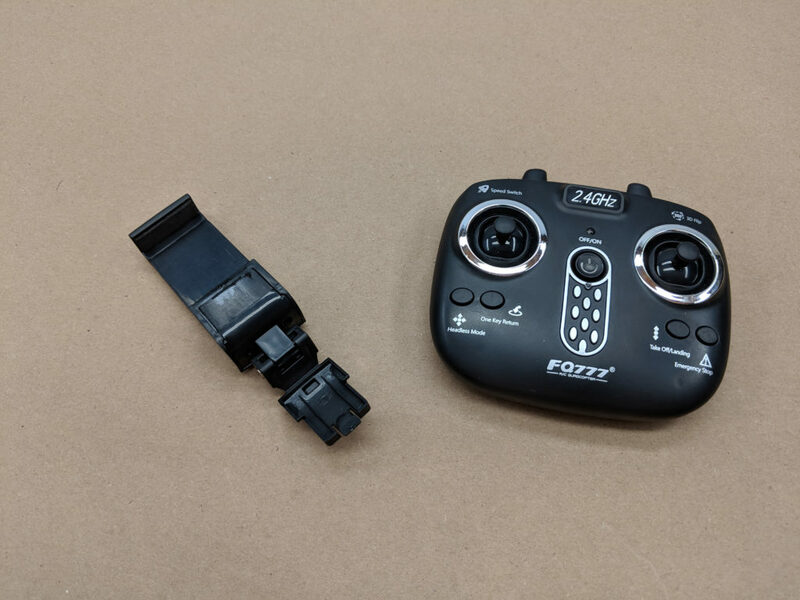 Look what I found inside – a small 2.4 gHz transmitter and a smartphone holder for the FPV option! 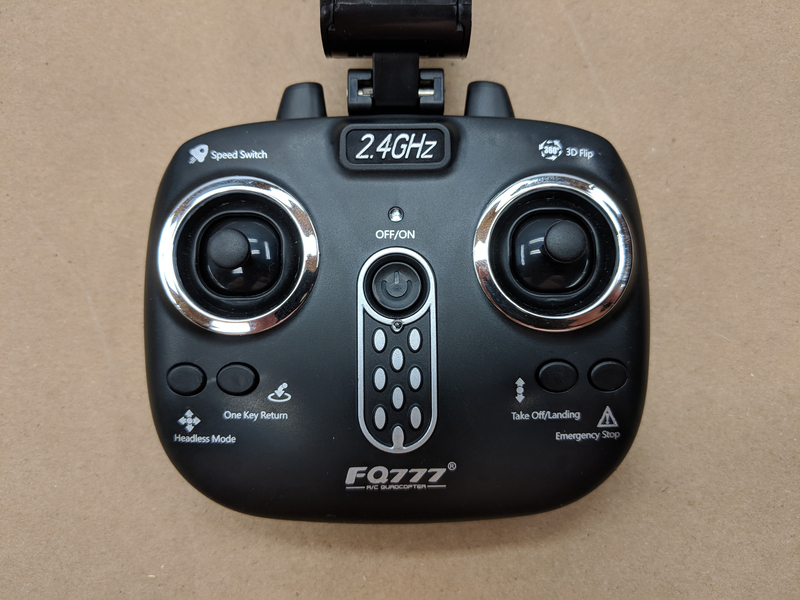 This is one small transmitter, but its got a ton of features packed into it! We’ll get to those features in a minute. 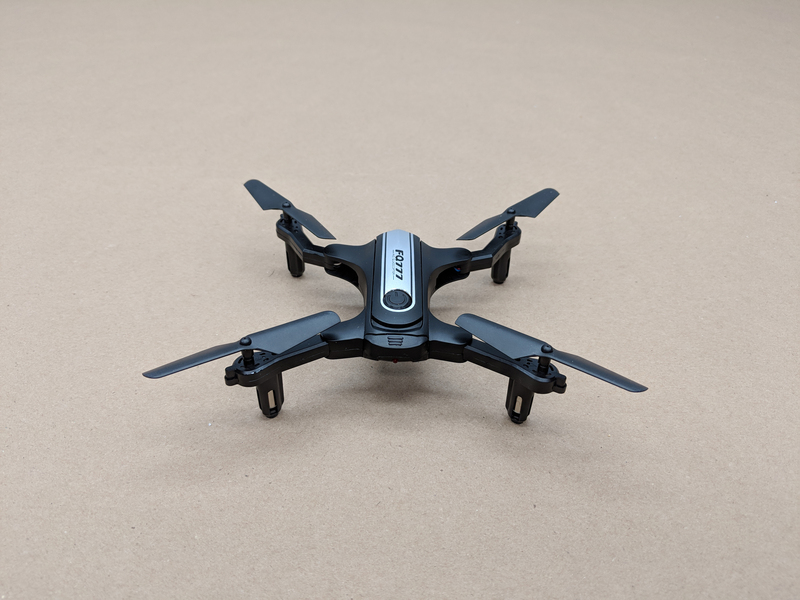 With the four arms folded, the quad is very small. It measure approximately 80mm square! 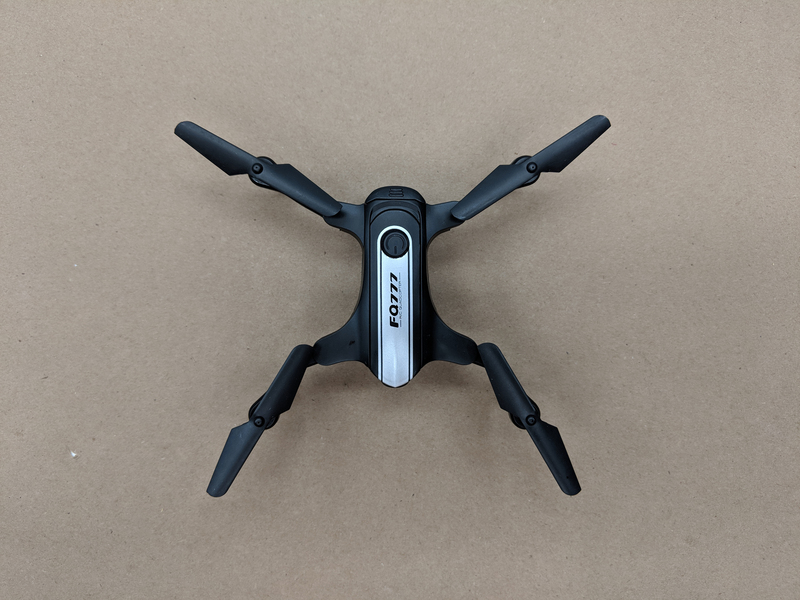 with the arms extended, the quad is slightly larger at approximately 132mm square. 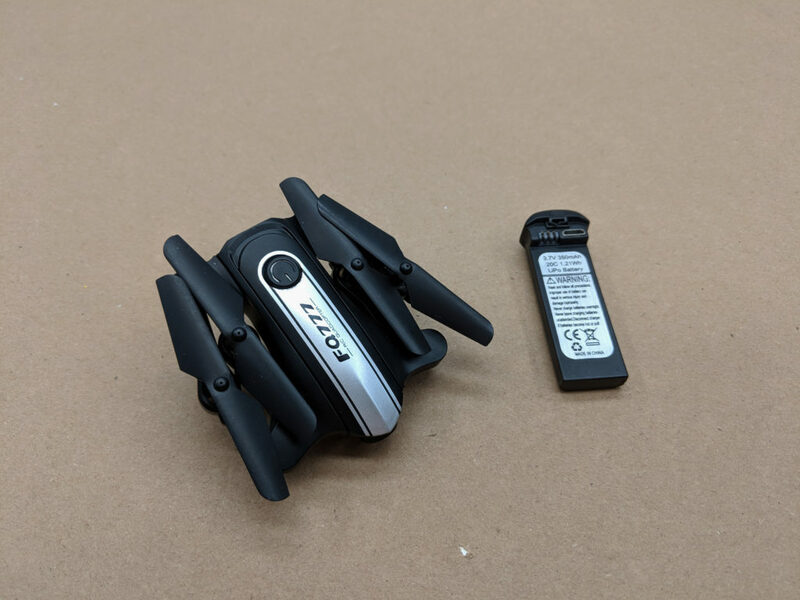 I like that the FQ31W has a removable battery, and the battery has a micro USB connection for charging! 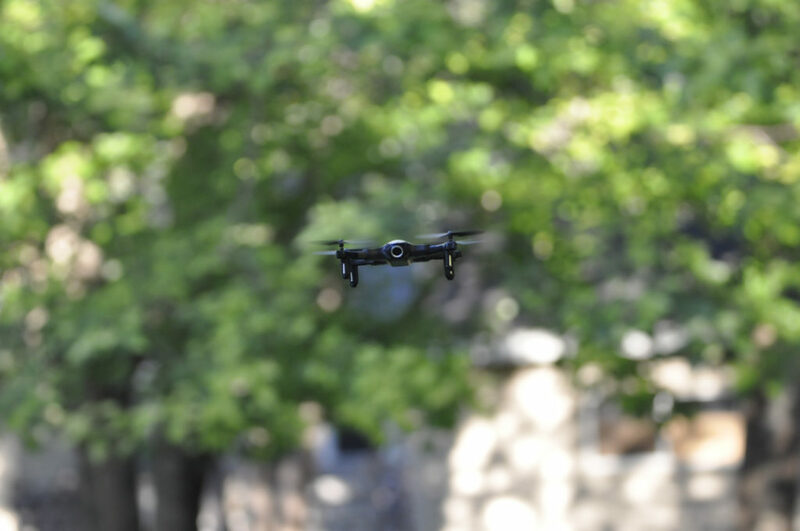 There’s a 2 MP 720P camera at the front of the quad’s frame – it’s a fixed position camera, and points downward a few degrees. 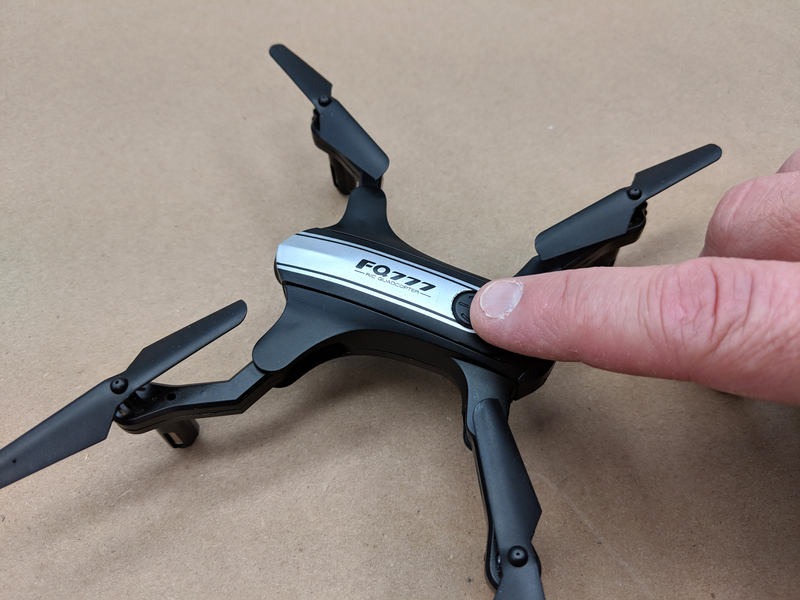 On top, there’s a power button to turn the quad on and off – I like that the button is large enough for most fingers. 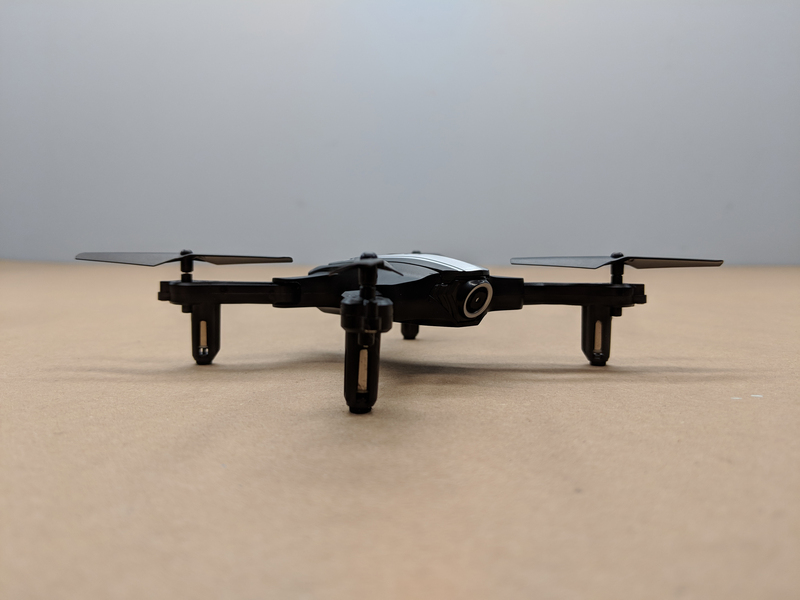 The four propellers are driven by geared motors, and the props are even pre-installed! 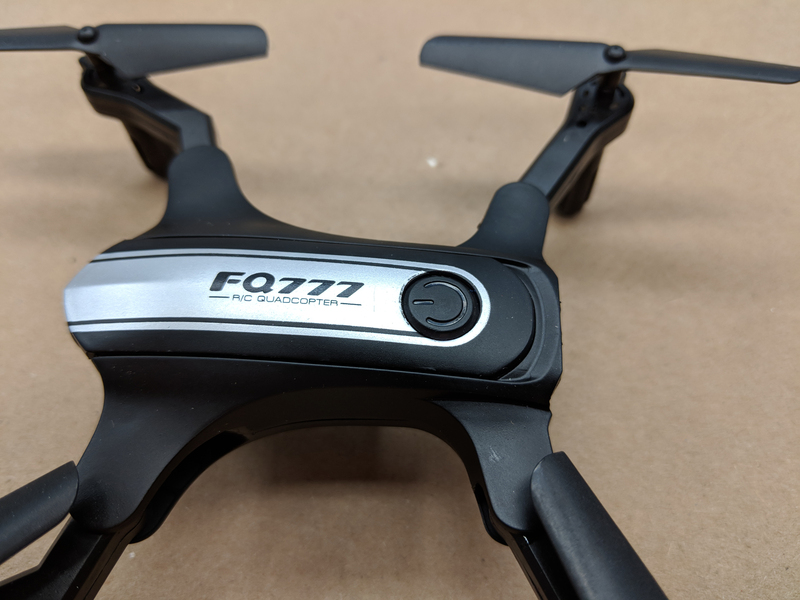 As I stated earlier, there’s a lot of features in this tiny quad – Starting at the top left of the transmitter, we have the speed switch. Top right is the 3D flip switch. The power button is in the middle, as well as the two sticks. The transmitter is set up for Mode 2 flying. Bottom left is the headless mode, followed by One Key Return. Bottom right has One Key Takeoff/Landing, and Emergency Stop. So what do all these buttons mean? Thats’ a great question! Speed Switch: There are three levels of flying expertise – low, medium, and high. Low offers the slowest flight speeds and least agility, while medium and high turn up the speed an agility in two more steps. As your experience grows with the FQ31W, you can try the medium and high selections, but I definitely recommend starting on the low setting – each setting is announced by one (low), two (medium), and three (high) beeps. 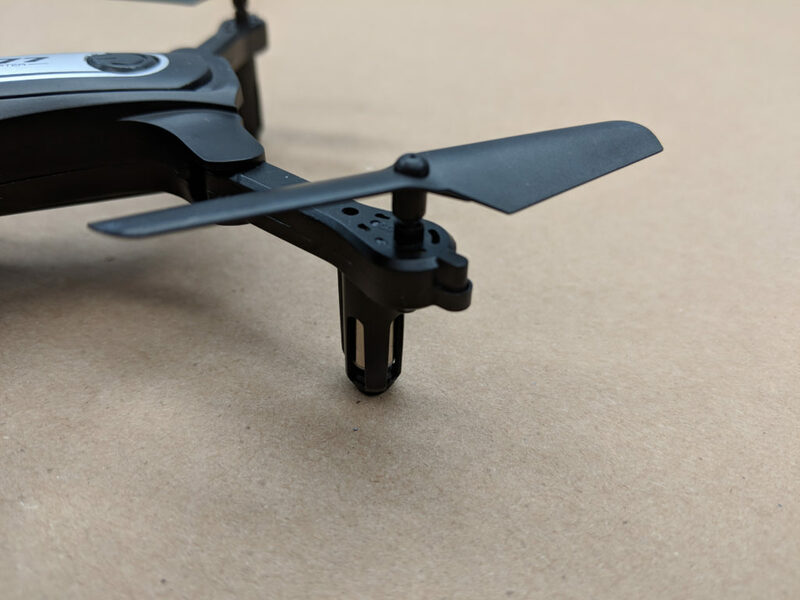 Headless Mode: When the headless mode is selected, it means that the quad will fly as if the camera is facing away from the pilot. 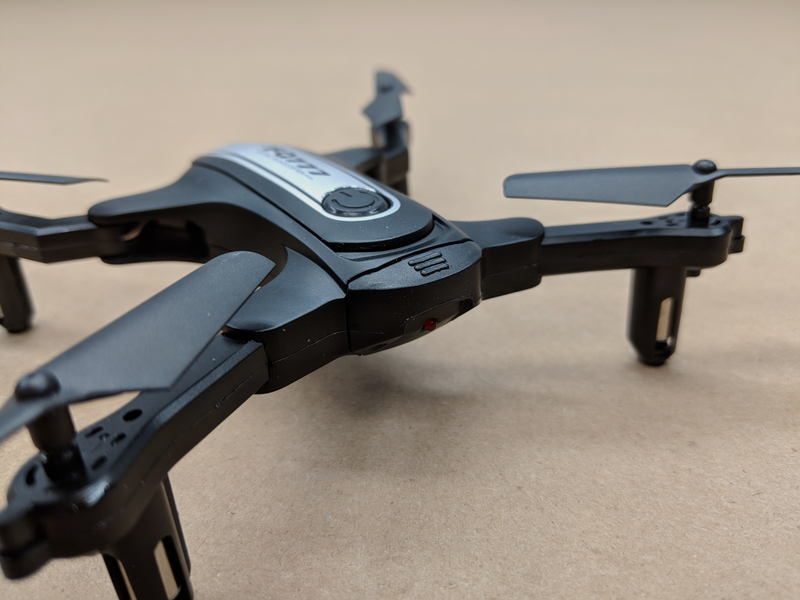 If the camera is turned 90° to the right, the left side becomes the front of the quad, and transmitter stick input will make the FQ31W fly ‘forward’ as if the left side is the front. One Key Return: While flying in the headless mode, the one key to return function makes it easy to find the way home. 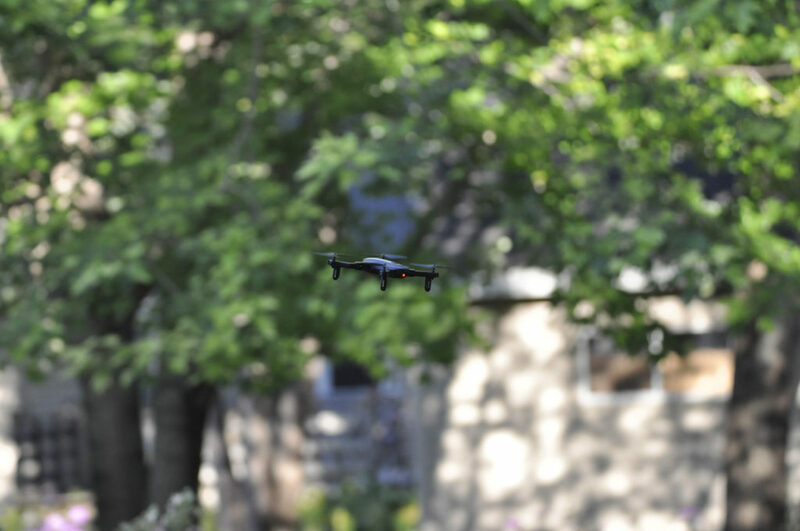 Simply press the button once, and the quad will fly back to the approximate spot from where it launched. 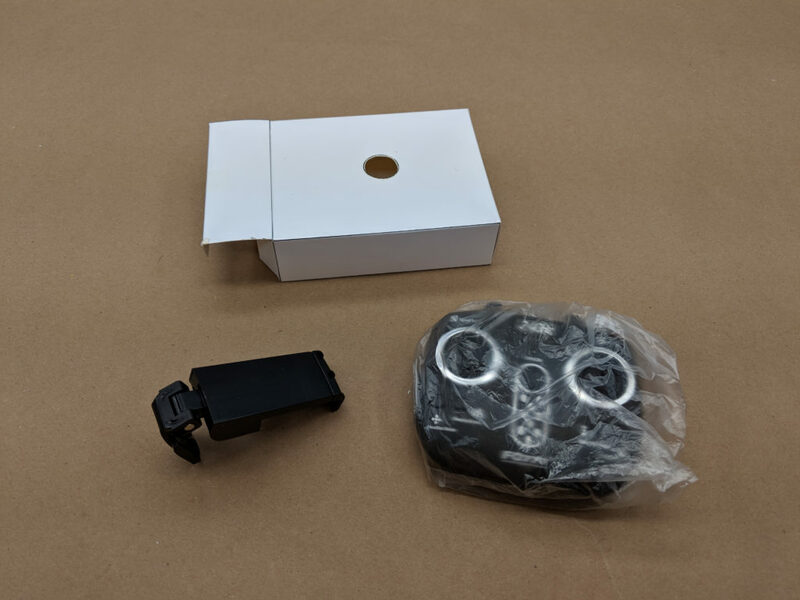 If the button is pressed a second time or the right stick is moved, the quad returns to normal flight mode. 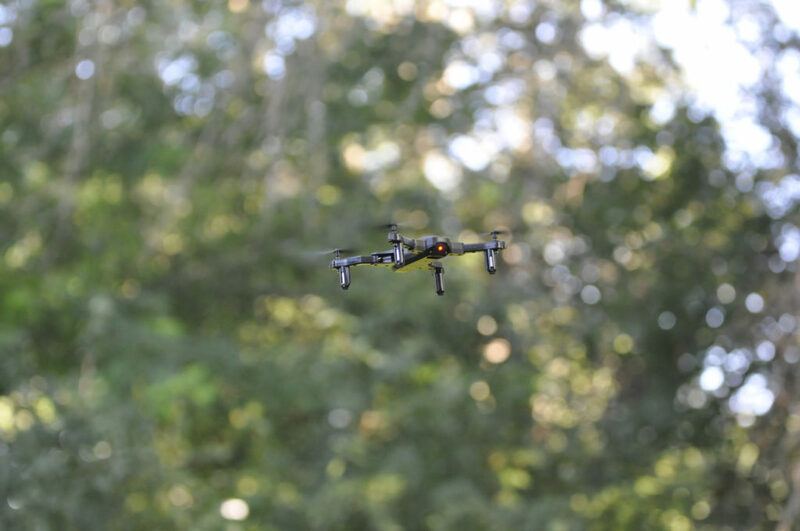 One Key Take Off and Landing: Press the button once and the FQ31W will take off and hover approximately one meter above the ground. If you press the button a second time, the quad will automatically land. 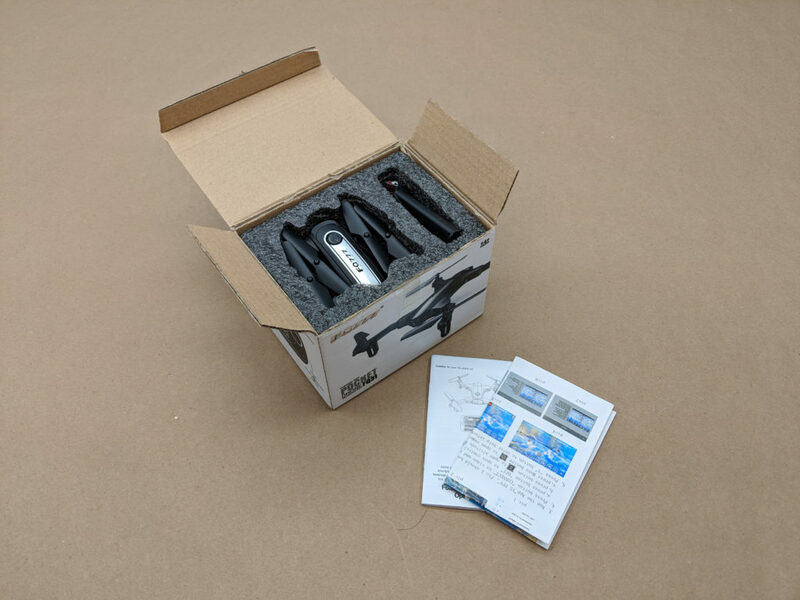 Unlike the One Key Return, this time, the quad will land wherever it is in location to you. Emergency Stop: Pressing this button will make the quad shut down immediately. 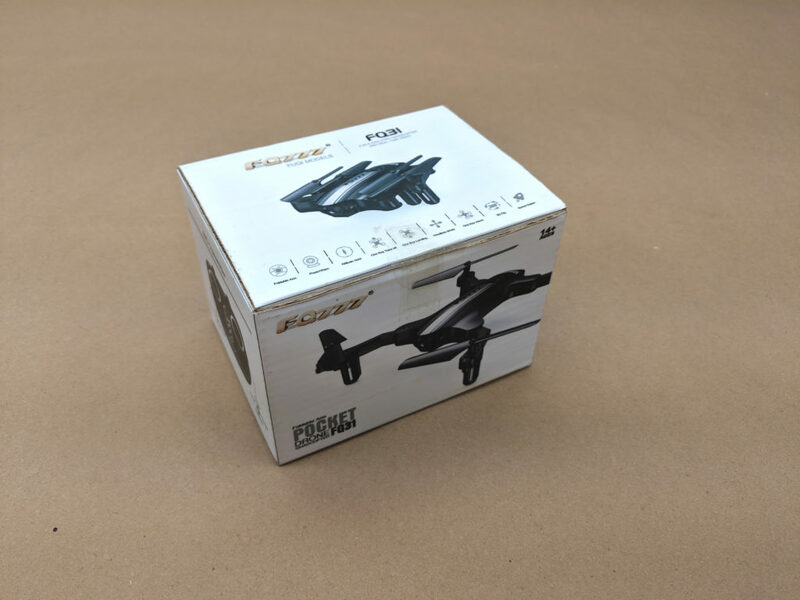 It’s good in the event of a crash, but you do not want to accidentally push it while flying. 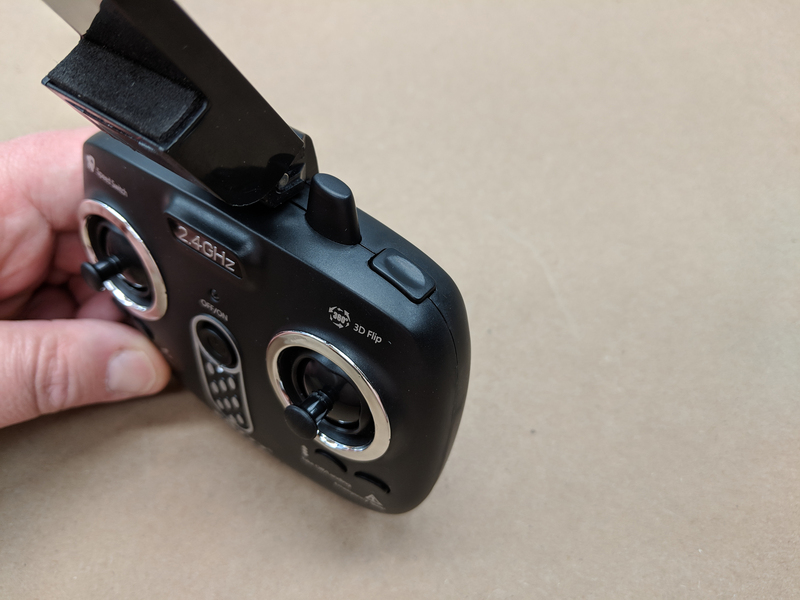 3D Flip: Pressing this button, followed by moving the right stick in one of four main directions (forward, rearward, right, or left) will make the quad flip in the direction chosen. For this test, I’m using an LG Stylo 2 smartphone. It’s a tight fit in the device holder on the transmitter, but it does fit! This phone measures 6-1/8″ tall by 3-1/8″ wide – it’s not small by any means. 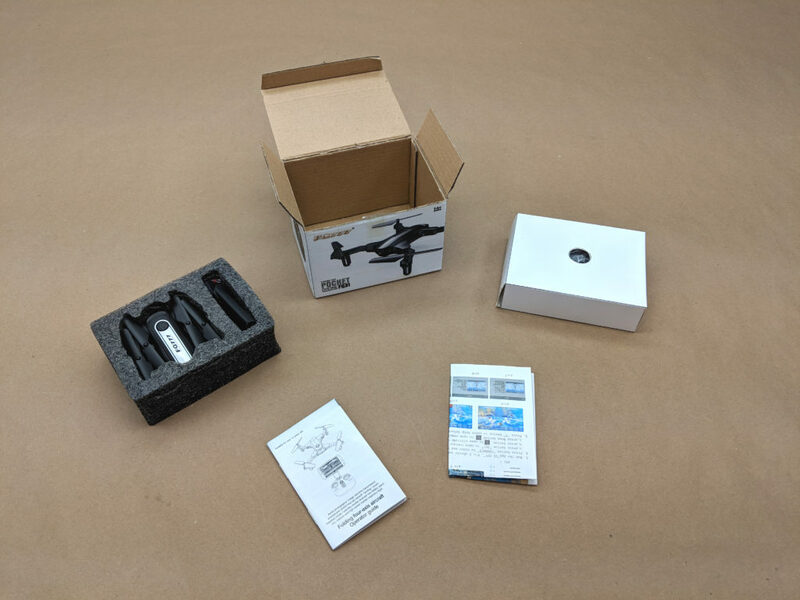 There are two pieces of literature included with the FQ31W – the instruction manual, and app instructions. 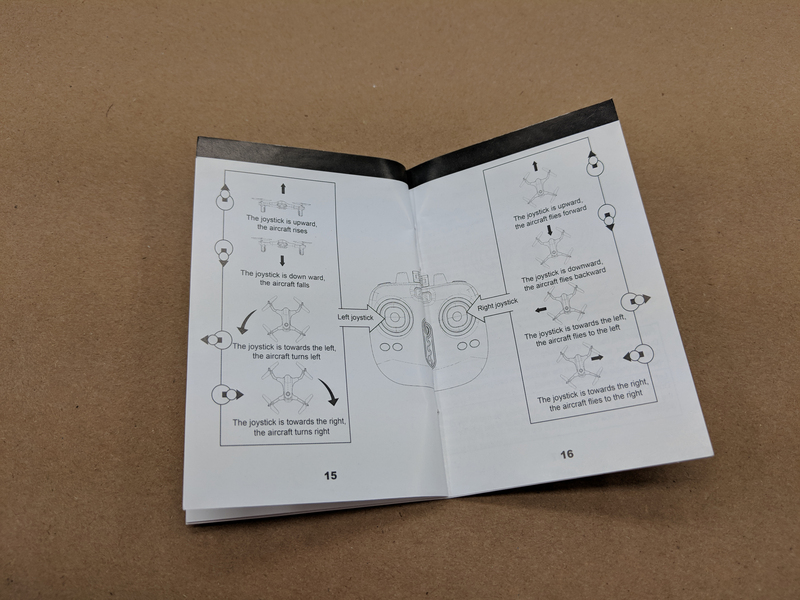 I was pleasantly surprised, as the instructions are pretty well written and have clear illustrations as well!. 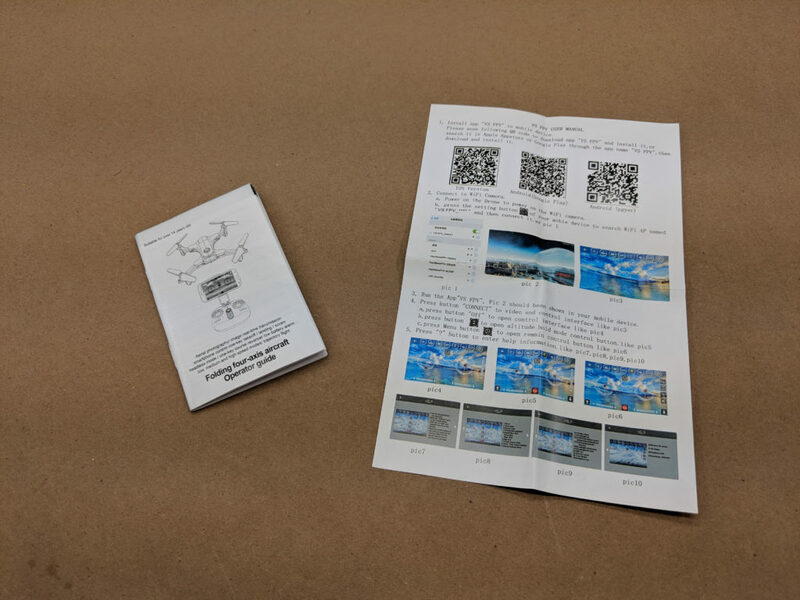 The app instructions are in two languages – English on one side, and Chinese (I believe, but I don’t know how to read Chinese…) on the other. A QC code is included, so you can simply scan it and get to the app in your favorite app store. It’s also available for IOS and Android operating systems! There’s not much to do for flight prep! 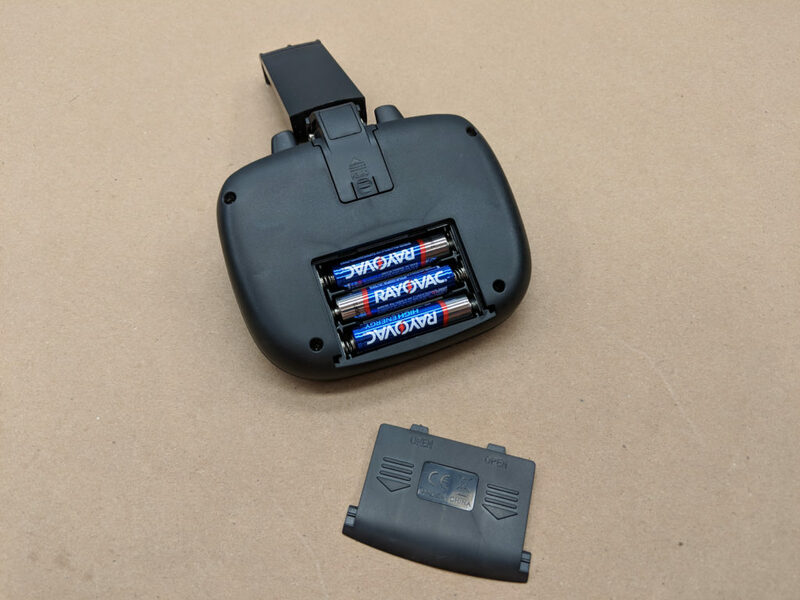 I had to install three AAA batteries in the transmitter, and charge the flight battery. You can use the supplied charging cord with a power supply – be it a phone charging brick or a USB outlet on a computer – you could probably even use a portable phone charging battery! 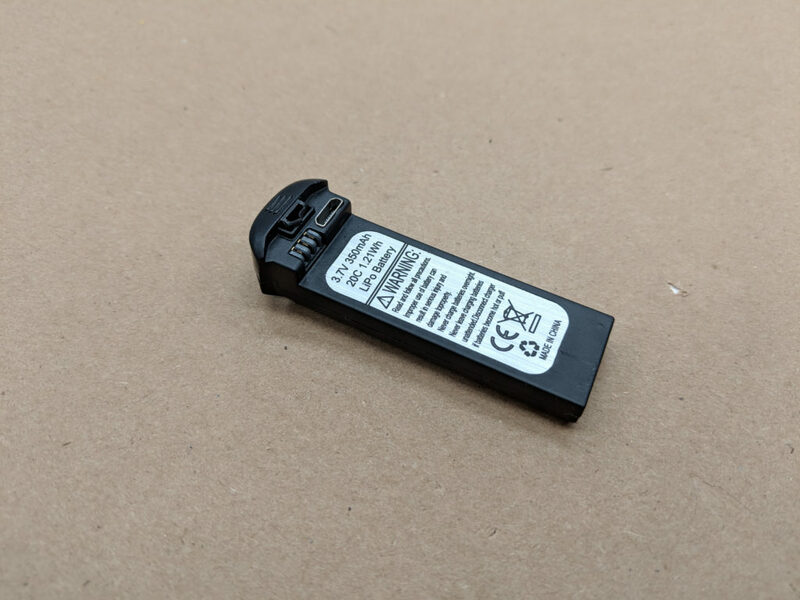 When the battery is charging, a small red LED is lit on the side of the battery opposite the micro USB connector. 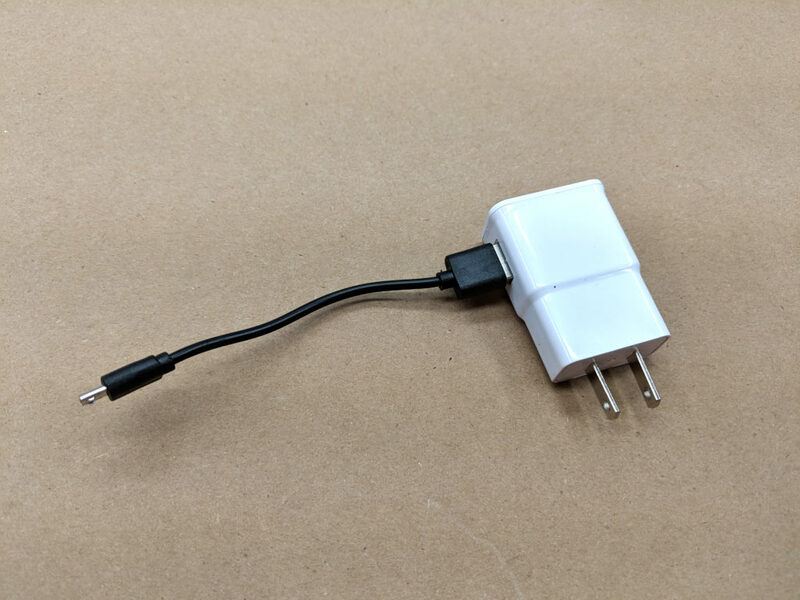 When the battery is fully charged, the small LED goes out. I inserted the battery in to the back end of the quad, and snapped it into place. 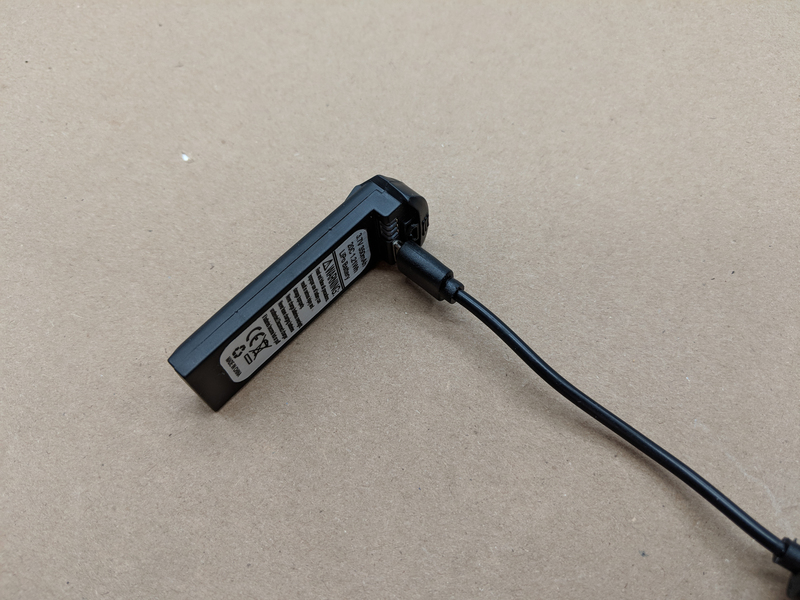 After turning on the transmitter, I pressed the power button for approximately one to two seconds while the FQ31W was sitting on a level surface. 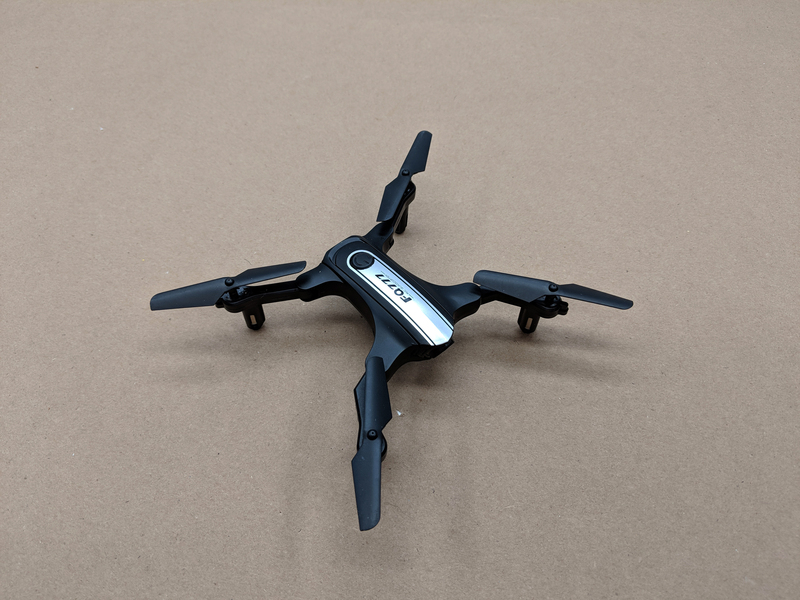 With the transmitter and quad powered up, I then connected the smartphone to the quad’s WiFi signal and opened the app. 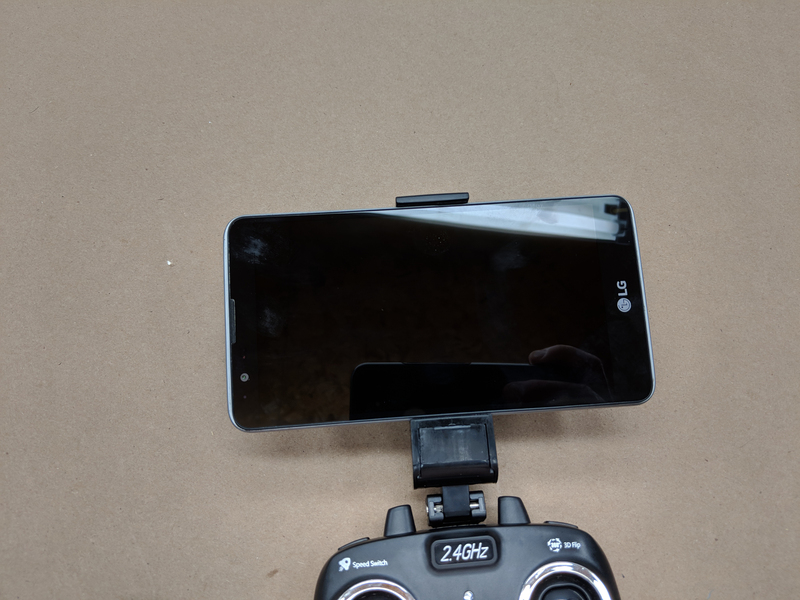 A few seconds later, an image appeared on the screen, and indicated that the phone was connected to the quad and the app was working properly. This is one good looking little quad! 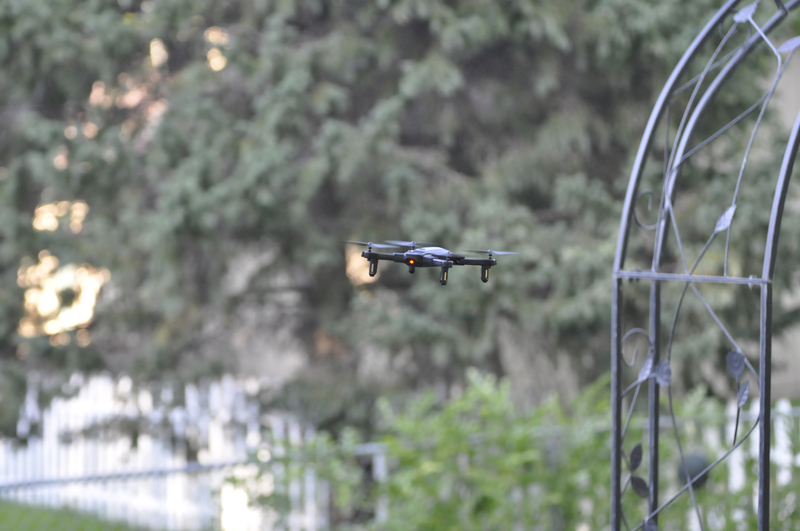 Because of the FQ31W’s small size, I was able to fly it in my basement immediately. I installed the flight battery, and got it ready. The quad was set on the floor in my basement, and I pressed the one key takeoff. 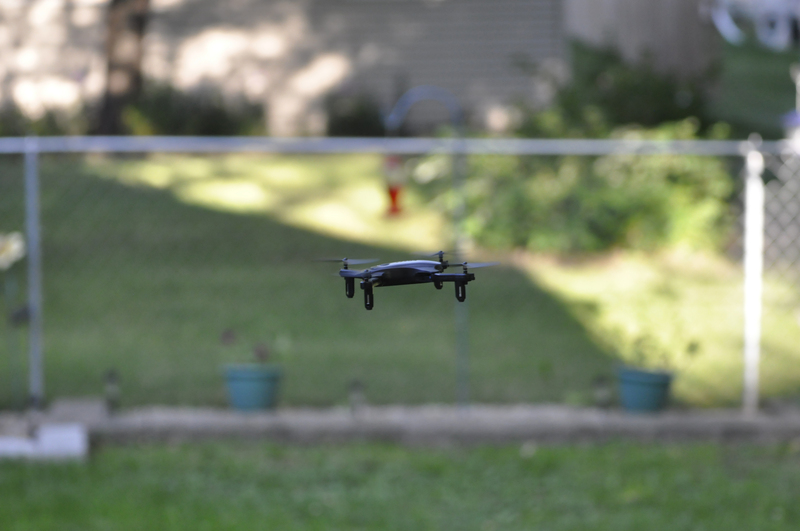 The motors came to life, and the quad popped up to a hover at approximately one meter high. 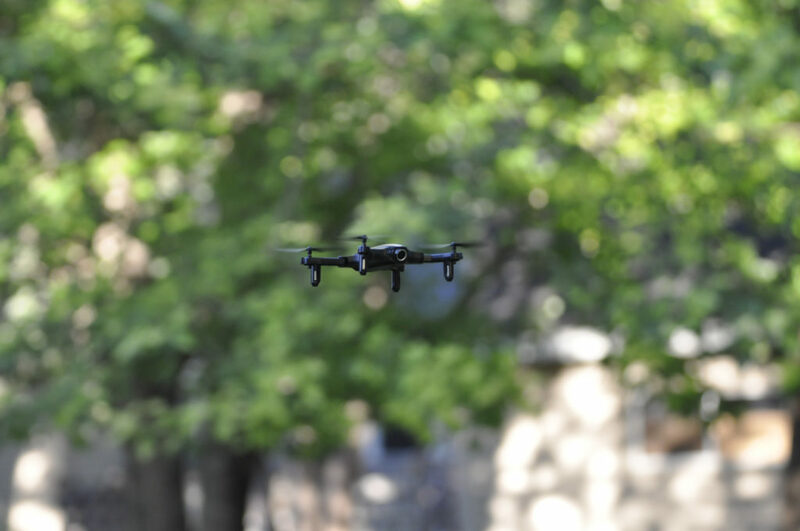 The transmitter starts you in the low speed setting, which keeps the controls dampened a bit for easier flying. The open floor space in my basement is about eight feet wide and ten feet long – it’s not a large area at all, but the FQ31W was easy to control in this small space. 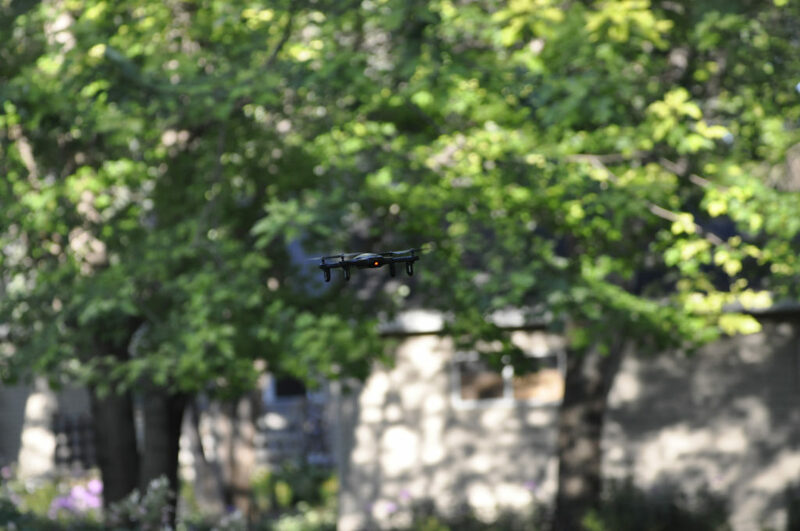 I never felt like I wasn’t in complete control of the quad, and it hovered very well! The altitude hold did a good job of keeping it at a steady height when the left stick was released. Left and right ‘rudder’ turns were easy, and intentional full rotation spins were smooth. The quad immediately stopped when the stick was released! 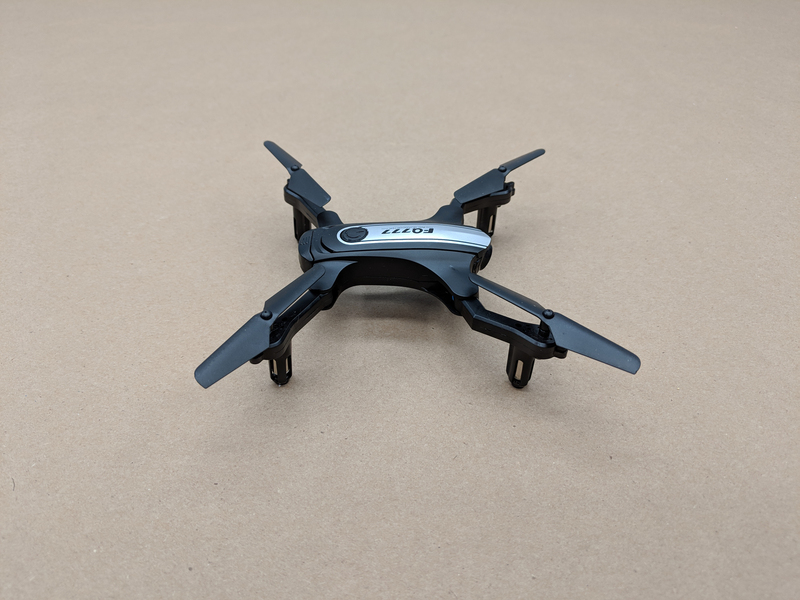 Fore and aft control, as well as left and right directional control, were easy thanks to the six-axis gyro inside the quad. 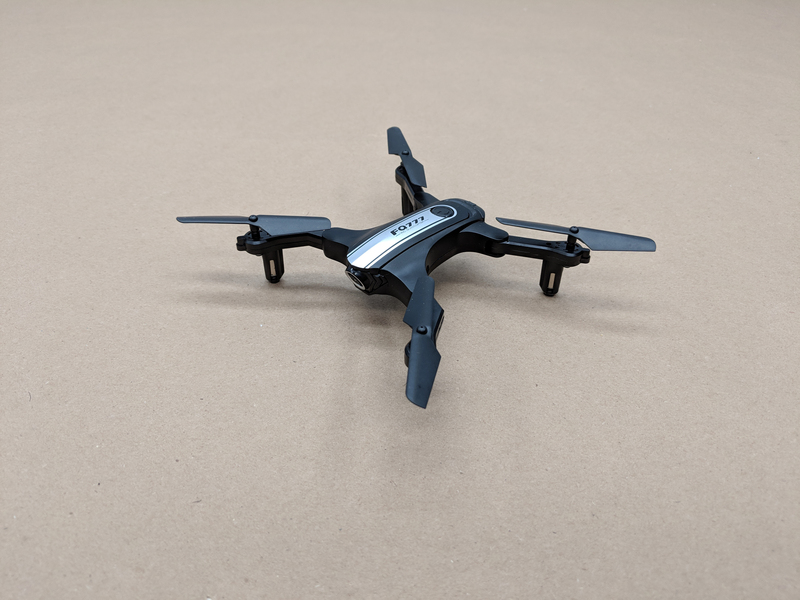 This little quadcopter handles really well indoors! 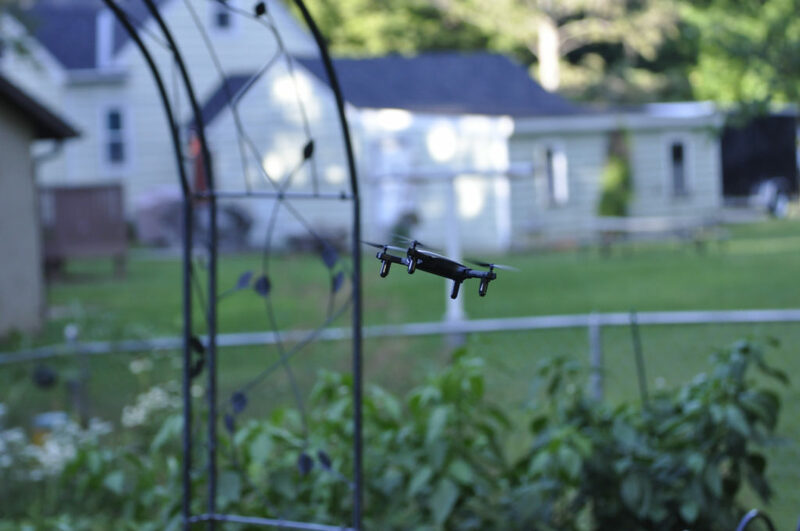 A few days later, I had my son fly the quad outside. 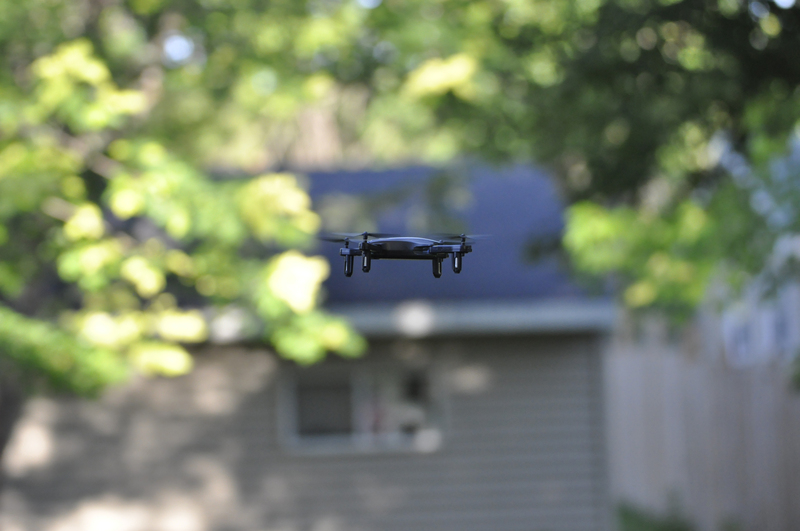 There was a slight breeze, which I thought would be a good test for the small drone. 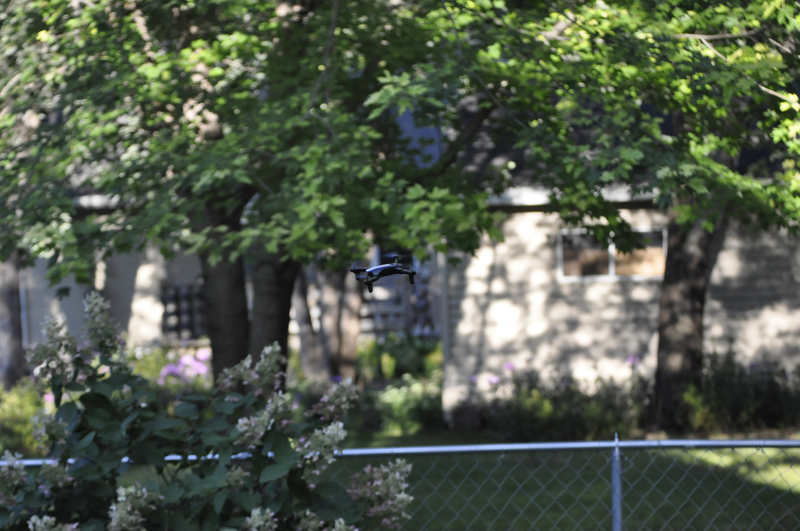 My son hasn’t done a whole lot of flying this year, but even he was able to easily fly the FQ31W. 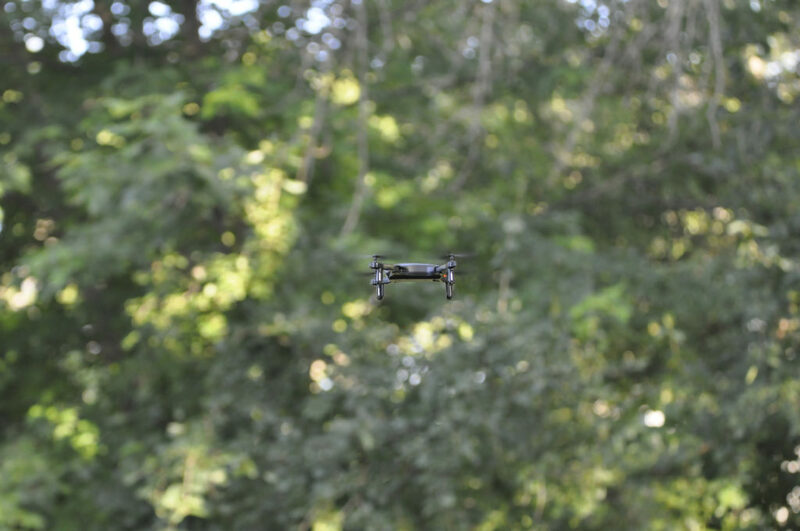 He also liked the FPV option, and was able to fly the quad by the screen alone. 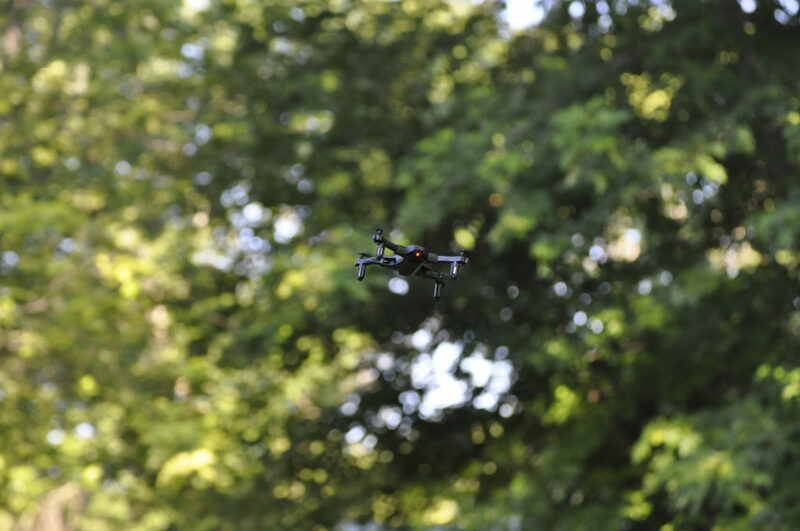 While I was running the cameras, He had a good time flying! 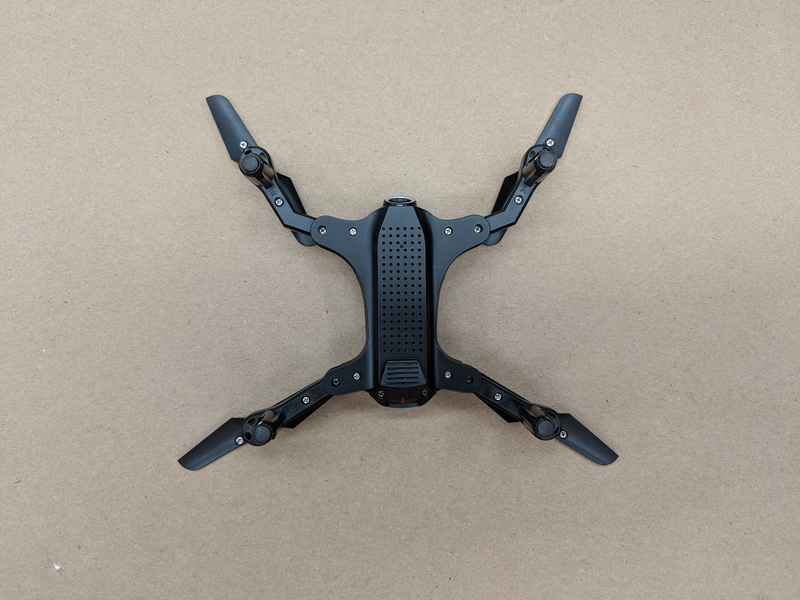 Check out the video below – I go into details about the quad in the video. 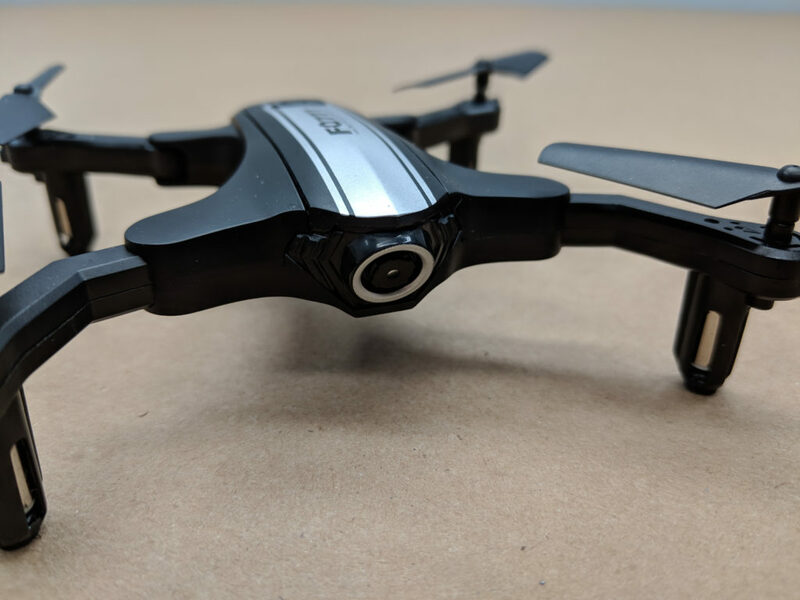 If you just want to see the quad fly, skip to the 11:20 minute mark, but there’s some pretty good info on the quad in the first 11 minutes as well! Landing the small quad is easy. 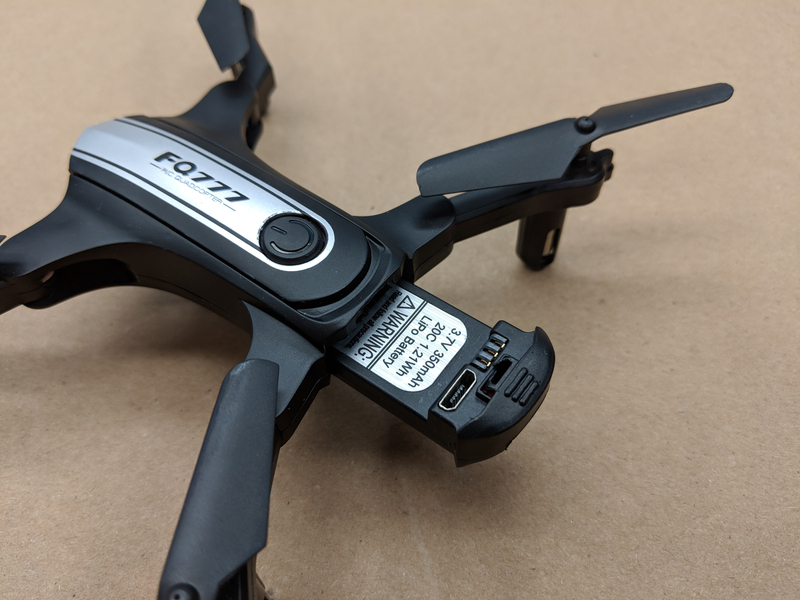 if you’re flying in the headless mode, you can press the ‘One Key Return’ button and the FQ31W will fly back to approximately the location from which it took off, and land itself. If you’re flying in the normal mode, simply fly it to where you want it to land and press the One Key Takeoff and Land button. the quad will then set itself down wherever it is. 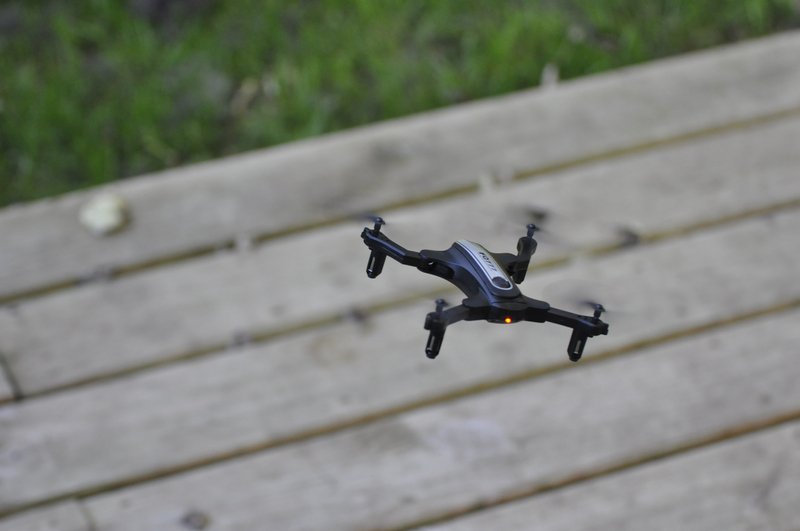 Both landing feature are nice, and make flying the FQ31W really easy! 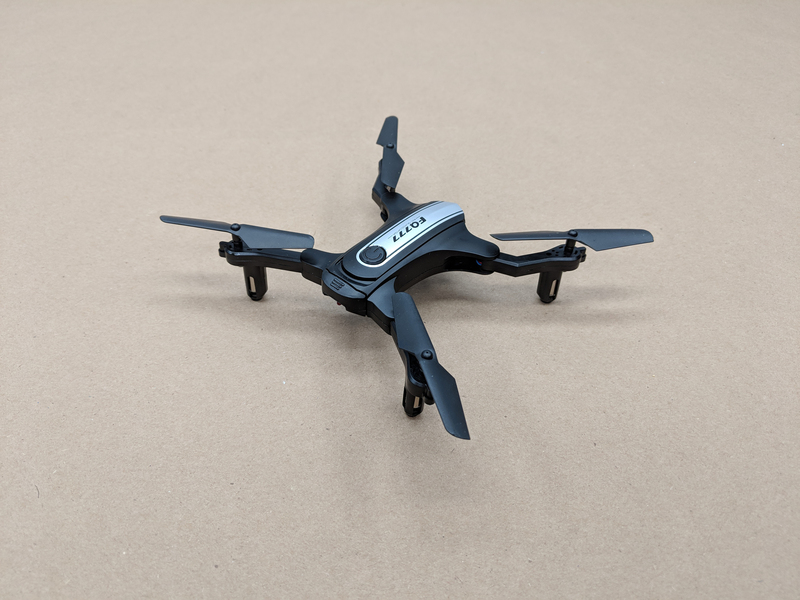 While the FQ31W is not a hobby grade quadcopter, it incorporates a lot of features that only higher end units may have. 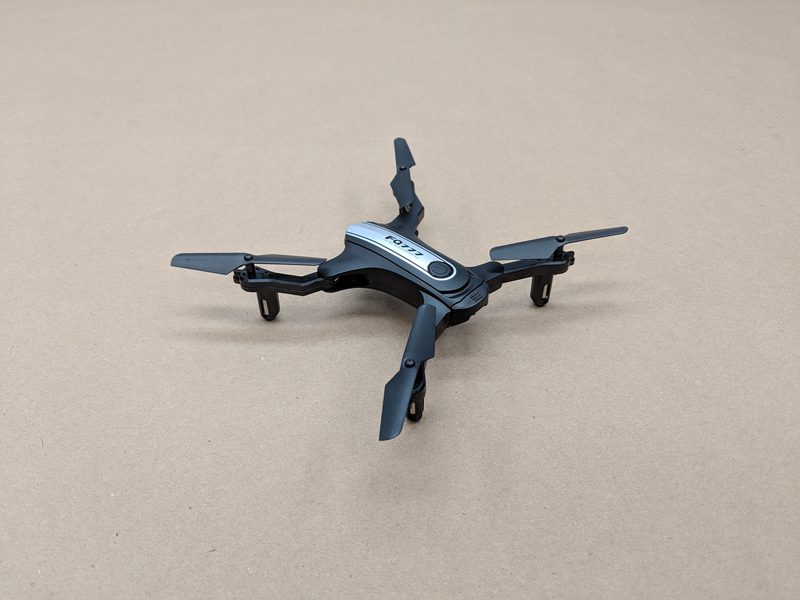 Remember, this quad costs less than $33.00 and includes free shipping! 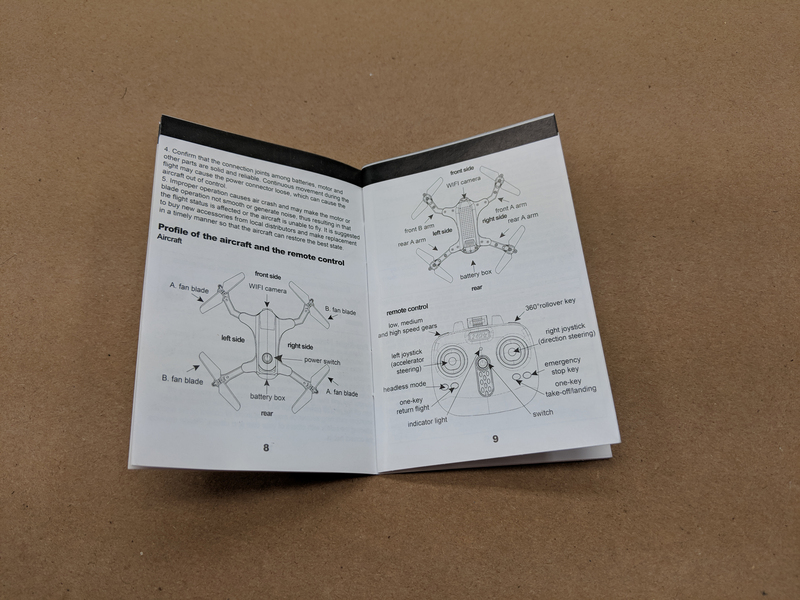 There’s no assembly, it flies well, and the instructions are good. The app is free, and the WiFi is supposed to be good to around 300 feet. 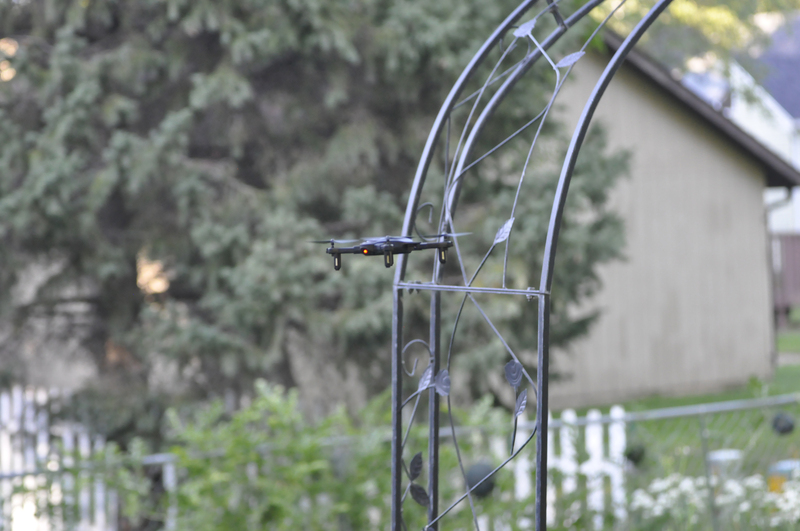 My back yard is too small to test this well, but I did have the quad over 100 feet from me without a loss in signal! 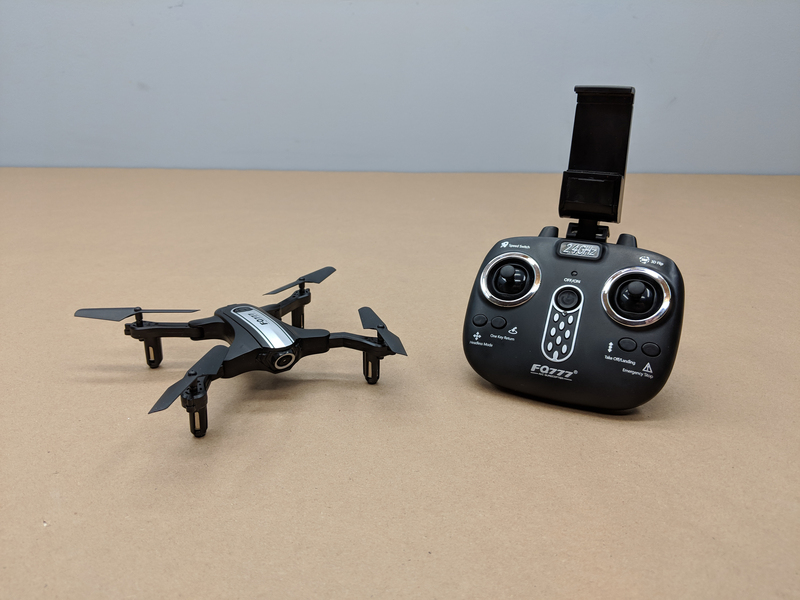 Even at 100 feet, it’s really hard to keep an eye on this small drone… For the price, it’s a great little quad that flies really well!